The hot and arid climate of the Arabian Peninsula gives a unique opportunity to enjoy the suggestive appearance of the shadow. 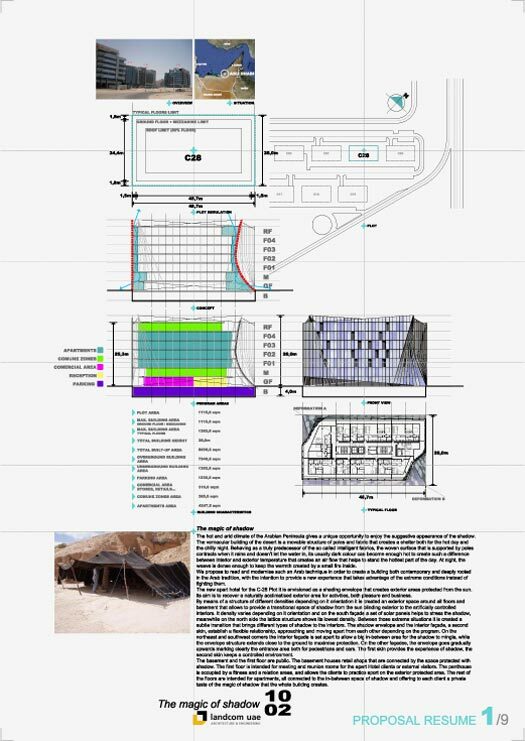 The vernacular building of the desert is a movable structure of poles and fabric that creates a shelter both for the hot day and the chilly night. Behaving as a truly predecessor of the so called intelligent fabrics, the woven surface that is supported by poles contracts when it rains and doesn’t let the water in, its usually dark colour can become enough hot to create such a difference between interior and exterior temperature that creates an air flow that helps to stand the hottest part of the day. At night, the weave is dense enough to keep the warmth created by a small fire inside. 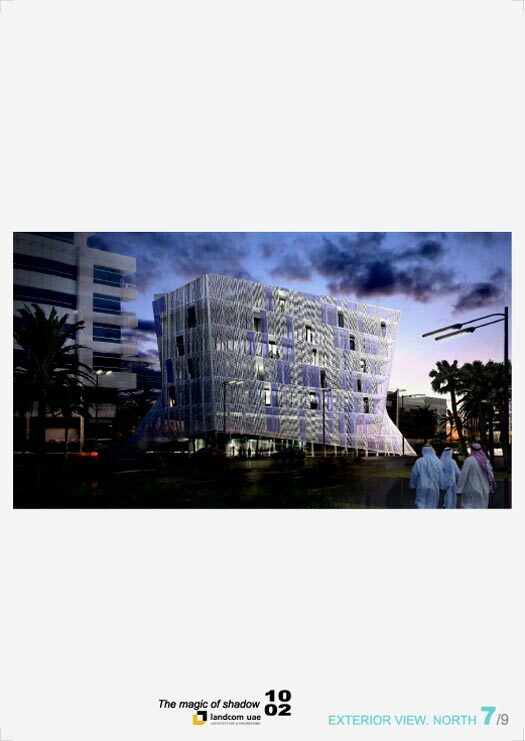 We propose to read and modernise such an Arab technique in order to create a building both contemporary and deeply rooted in the Arab tradition, with the intention to provide a new experience that takes advantage of the extreme conditions instead of fighting them. 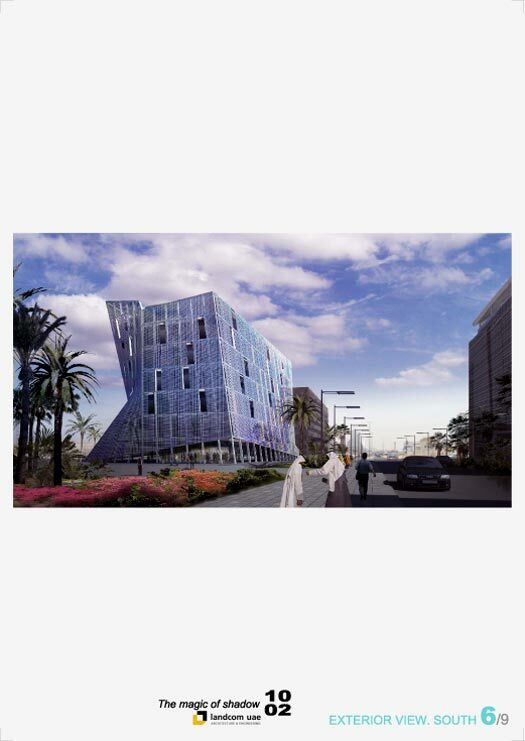 The new apart hotel for the C-28 Plot it is envisioned as a shading envelope that creates exterior areas protected from the sun. Its aim is to recover a naturally acclimatised exterior area for activities, both pleasure and business. 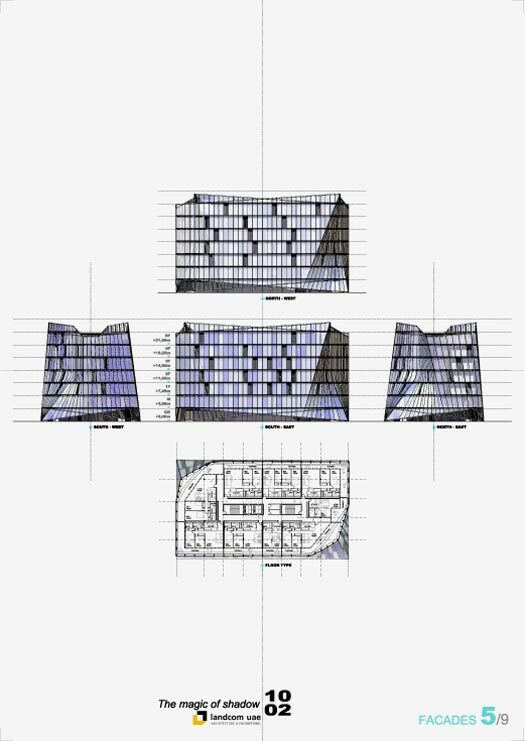 By means of a structure of different densities depending on it orientation it is created an exterior space around all floors and basement that allows to provide a transitional space of shadow from the sun blinding exterior to the artificially controlled interiors. It density varies depending on it orientation and on the south façade a set of solar panels helps to stress the shadow, meanwhile on the north side the lattice structure shows its lowest density. Between those extreme situations it is created a subtle transition that brings different types of shadow to the interiors. 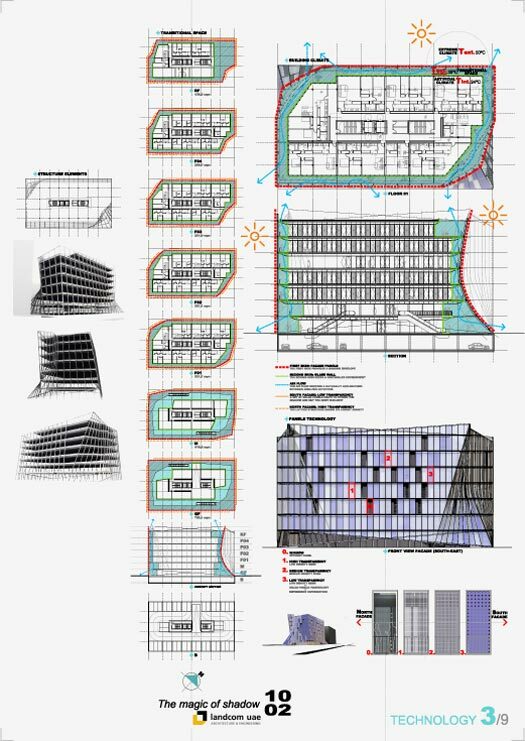 The shadow envelope and the interior façade, a second skin, establish a flexible relationship, approaching and moving apart from each other depending on the program. 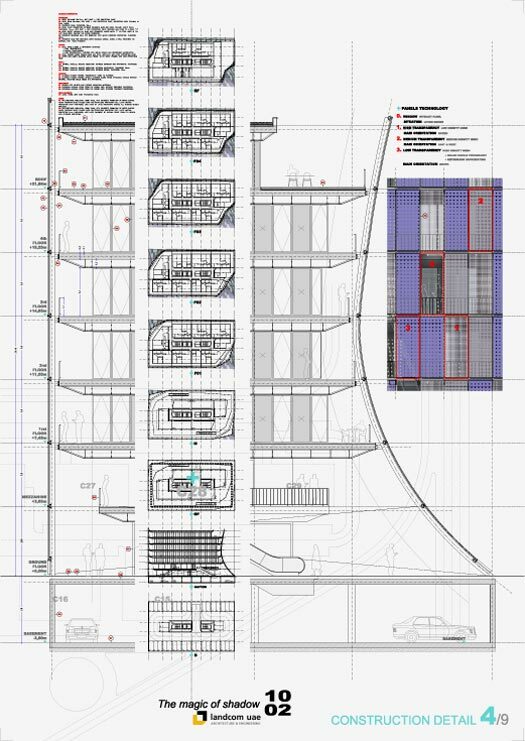 On the northeast and southwest corners the interior façade is set apart to allow a big in-between area for the shadow to mingle, while the envelope structure extends close to the ground to maximise protection. On the other façades, the envelope goes gradually upwards marking clearly the entrance area both for pedestrians and cars. The first skin provides the experience of shadow, the second skin keeps a controlled environment. The basement and the first floor are public. The basement houses retail shops that are connected by the space protected with shadow. 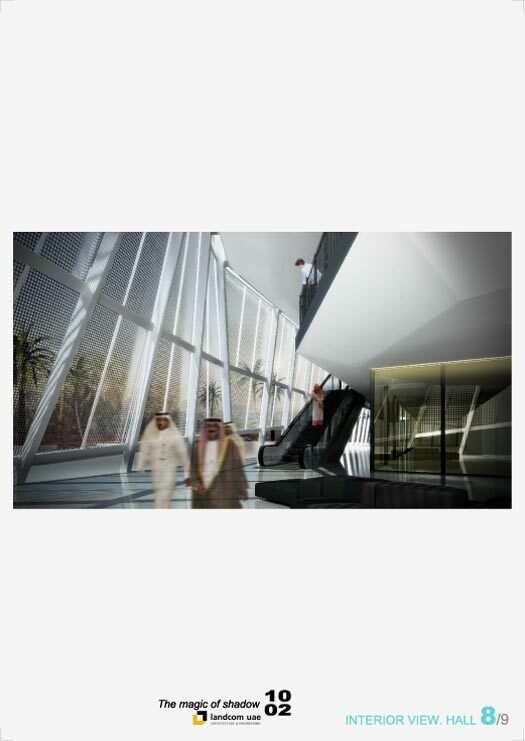 The first floor is intended for meeting and reunion rooms for the apart Hotel clients or external visitors. The penthouse is occupied by a fitness and a relation areas, and allows the clients to practice sport on the exterior protected area. The rest of the floors are intended for apartments, all connected to the in-between space of shadow and offering to each client a private taste of the magic of shadow that the whole building creates. 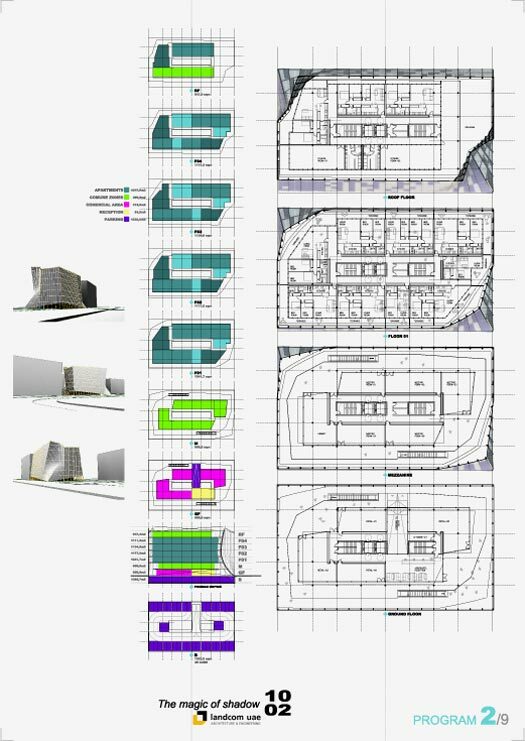 This entry was posted in 01.SITUATION, 02.TYPOLOGY, abu dhabi, Front to back, hotel, housing, united arab emirates by XCL. Bookmark the permalink.